Omelettes are a topic on which volumes have been written and well deservedly so. There is something so fundamentally simple about them but when eating them I experience a sense of leisureliness and slow luxury. One needs to put a little time and thought into the preparation of a good omelette. The pan you use needs to especially suited to the task. The filling you choose should be of delicate flavours and not over shadow the egg flavour. Timing is also a consideration as one should eat an omelette as soon as it leaves the pan. To some this might all seem a bit overwhelming before tackling what is actually a very simple dish. But it should rather act as a reminder to slow down and take the proper care needed before tackling an omelette. 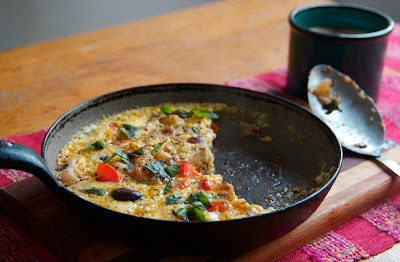 A good non stick pan with sloped sides is almost essential to make a stress free omelette. I prefer to make individual omelettes or at most an omelette to be shared by two. For this you would need a small pan no bigger than 24cm in diameter. I would use two large eggs per person. I like to crack the eggs into a bowl and lightly combine them with a fork, but not beating them. I add a pinch of salt and perhaps some pepper and set it aside until ready for use. Before you start cooking you need to decide on your filling. This is a personal choice but I would advise to keep the flavours mild and not over fill the omelette. In the above image I used black mushrooms which I had lightly fried in butter, black pepper and a teaspoon of soya sauce. To this is I added fresh tomato, basil and little crumbled feta. Now you can start by heating the pan to medium high heat. This is a good time to start your toast if you are having it. Add a knob of butter and allow it cover the pan and sizzle until just before it starts to brown. Add the eggs and swirl them around to cover the bottom of the pan. If bubbles puff up under the egg, you can pierce the bubble and allow some raw egg to run into the whole and seal the gap. Once the egg is mostly cooked but still a little wet on top you can add the filling to one half of the omellete. Using a non stick pan spatula, slide it under the unfilled part and flip it over the filling. Now you can gently slide your omelette on a plate, grab your toast and settle down to enjoy. Now to confuse matters more, there are two kinds of omelette to consider as well. 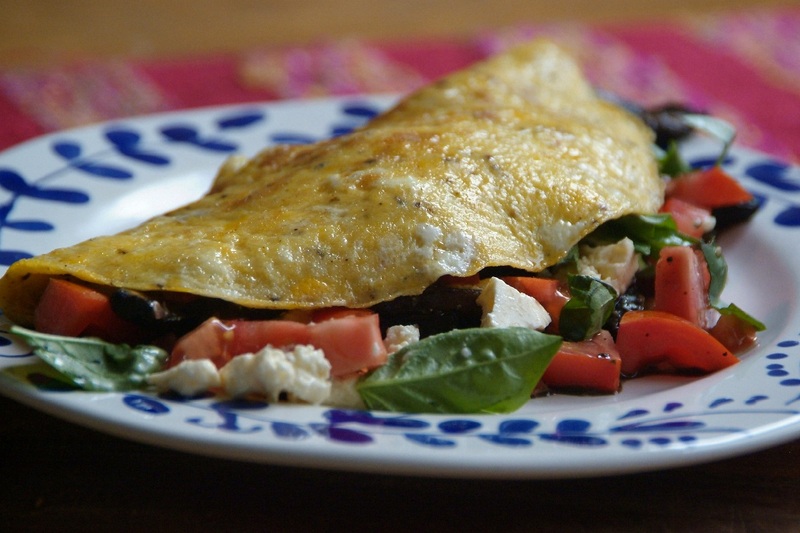 The traditional french fold over omelette and the spanish omelette or frittata. But I will get into the frittata another time. My pleasure! Hope to keep on providing inspiration for great meals.